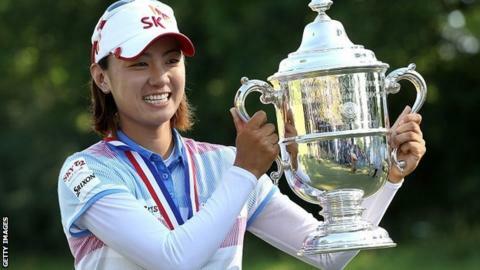 South Korea's Na Yeon Choi won the US Women's Open with a four-shot victory over compatriot Amy Yang. Choi, 24, fired a one-over 73 at Blackwolf Run in Wisconsin for a seven-under total of 281, with the top two the only under-par scores in the field. It was a first major title victory for Choi who had to recover from a mid-round wobble. Germany's Sandra Gal carded a 74 on Sunday to finish third, while England's Melissa Reid was tied 50th on 14 over. She was joined by world number one Yani Tseng of Taiwan on the same score, with the United States' former champion Paula Creamer finishing tied seventh on three over par. Choi's triumph came on the same course where Se Ri Pak won the 1998 US Women's Open, a victory Choi recalls watching on television as a girl. And she became the fourth South Korean winner in the last five years. "My dream's come true," Choi said. "It's an amazing day and I really appreciate what Se Ri did and all the Korean players did. It's really no way I can be here without them." Despite starting the day with a six-shot lead, Choi had plenty of work to do after a triple-bogey eight at the par-five 10th hole, meaning the lead over Yang was cut to two shots. But Choi bounced back with a birdie at 11 and, after a couple of other scares, she picked up birdies at 15 and 16 to regain control and win her sixth LPGA title. The win should mean that she rises from fifth to number two in the world rankings.